"My mother used to make this pizza; she didn't cook much so you know it's easy! And it tastes great!" Place asparagus on a baking sheet; drizzle with olive oil and sprinkle with salt and pepper. Bake the asparagus in the preheated oven for 10 minutes. While asparagus is baking, spread the pizza sauce over the pizza crust. 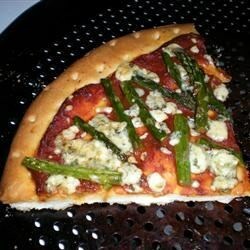 Distribute asparagus pieces and crumbles of blue cheese evenly over the pizza. Return pizza to center rack of preheated oven; bake until the cheese is melted and bubbling, 8 to 10 more minutes. See how to make a white pizza with ham, asparagus, and two cheeses. this was ok. the flavors didn't really mesh as well as I had hoped...surprised people rated it so high. Not great, really just fair. This was very easy to make and surprisingly good. I wasn't sure how the flavors would mesh on a pizza, but my husband loved it. I did add crumbled turkey bacon for a little extra flavor. I did not use the tomato sauce base - instead I used fresh tomatoes with asparagus and cheese and thought it was quite good. Added some fresh oregano as well.